Iobst: "CIVIL WAR MACON: The History of a Confederate City"
Situated along the banks of the Ocmulgee River near the state of Georgia's geographical center, the industrious town of Macon experienced an even greater economic boon during the Civil War years. Richard Iobst's excellent Civil War Macon: The History of a Confederate City, originally published in 2000 and newly re-released in paperback, remains the standard work on the important Georgia town. At over 450 pages, Iobst's study is a lengthy one, but, given the town's economic and military importance to the Confederate cause, such attention is entirely appropriate. The author begins with an overview of the Macon citizenry's reaction to the secession movement that gripped the lower South, as the city fathers and local merchants prepared for the possibility of armed conflict. The organization of militia and volunteer units is covered in some detail, as well as the routines of civilian society far from the front lines. Another chapter, making good use of newspaper and manuscript source materials, examines the increasing challenges to civilian life in Macon between 1862 and 1864, and how they were met. Macon's location afforded protection from immediate harm from enemy raids or invasion. This, and its good transportation links, made the town a prime location for military hospitals. The number of patients treated in Macon exploded with the September 1863 Battle of Chickamauga, and Iobst devotes a chapter to the organization, supply, and staffing of the military hospitals, most notably the Floyd House Hospital and the converted Blind Academy (later renamed the Ocmulgee Hospital). The geographical advantages that made Macon a good site for military hospitals also made it a prime location for a POW camp. Iobst discusses the prisoner conditions at Camp Oglethorpe, as well as its administrative difficulties. Three chapters meticulously describe the operations of Macon's Confederate arsenal, armory, and central laboratory. While the powder works at Augusta is more famous, the facilities at Macon were also of great importance to the Confederate war effort. Iobst chronicles well the expansion of existing factories, as well as the construction of new ones, all in the face of a constant lack of proper funding, equipment, and both skilled and unskilled labor. Their output is profiled in these chapters, and the laboratory's importance as an ordnance and ammunition testing facility is outlined. Students of Confederate logistics and supply will find these sections of great interest. The latter chapters are largely comprised of well constructed tactical histories of the fighting that occurred just outside the city gates, first with Stoneman's Raid in the summer of 1864 to be followed only weeks later by the March to the Sea. The city ultimately fell to the command of General James H. Wilson during his famous 1865 raid. A lengthy final chapter discusses life in the city under Wilson's military occupation. If there is any complaint with Civil War Macon, it is with the dearth of maps. A single rough drawing of the fortifications located around the outskirts of town is included, but a detailed street map really should be a part of every city study. Tactical maps of the otherwise well described actions fought near Macon would have been very helpful, as well. Nevertheless, Civil War Macon is one of the best Civil War city studies available in the literature today, a model history of exceptional depth. Highly recommended. 1. General Sterling Price and the Confederacy by Thomas C. Reynolds, edited by Robert G. Schultz (Missouri History Museum Press, 2009). Price clashed on a personal level with many important Confederate figures, and Thomas Reynolds (who became Missouri's 'Confederate governor' with the death of Claiborne Jackson) was one of them. Half of the book is Reynold's manuscript, centering on 1863-1864 period encompassing the Helena, Little Rock, and Price Raid disasters, with the balance comprised of Schultz's notes and supplementary materials. Published by the Missouri History Museum, this book is distributed by the University of Missouri Press. It looks to be well worth a look. 2. West Pointers and the Civil War: The Old Army in War and Peace by Wayne Wei-siang Hsieh (UNC Press, 2009). Discussions of West Point's role in the institutional transformation of the Old Army throughout the 19th Century, as well as the amateur vs. professional debates, populate the Civil War literature to some degree or another, and it will be interesting to see what Hsieh's book contributes to the historiography of the subject. 3. National Geographic Atlas of the Civil War: A Comprehensive Guide to the Tactics and Terrain of Battle by Stephen Hyslop and Neil Kagan (National Geographic, 2009). If yet another "comprehensive" Civil War atlas is to be published, it should ideally be populated with previously unpublished maps and/or original creations that artistically and informationally distinguish the work from the others in order to be considered truly worthwhile. Unfortunately, this new atlas appears to largely fail on both counts. Clary: "A HISTORY OF THE 15TH SOUTH CAROLINA VOLUNTEER INFANTRY 1861-1865"
James Clary's A History of the 15th South Carolina Volunteer Infantry 1861-1865 is part of the second batch of releases from Broadfoot Publishing's South Carolina Regimental-Roster Set. I've only seen two of the seven volumes released so far, so I can't accurately judge the series as a whole, but Clary's effort is one well worthy of emulation by future contributors. At 300-plus pages, Clary's narrative history of the 15th regiment's military service contains more than enough detail to satisfy demanding readers. It also highlights features of several campaigns that have not received adequate coverage in the literature. The South Carolinians experienced their first combat during the 1861 Battle of Port Royal Sound. Following its stay along the coast, during the summer of 1862, the 15th was transferred to the Virginia front, participating in the major engagements of Longstreet's command as part of Thomas F. Drayton's brigade. Drayton was later removed, and the 15th ended up under the command of Joseph Kershaw from late 1862 onward. Kershaw's brigade fought at Chancellorsville and Gettysburg, before being transferred with Longstreet's Corps to East Tennessee. In the spring of 1864, the men returned to Virginia, and endured the Overland Campaign and further fighting in the Shenandoah. In January 1865, the 15th South Carolina was sent home to oppose William T. Sherman's march through the Carolinas, finally surrendering at Greensboro, NC in April. Clary's narrative is well researched, utilizing a well proportioned mix of unpublished and published material. The section dealing with the regiment's role in the Carolinas campaign was especially noteworthy. Another highlight of the book is the cartography, a total of 94 maps (most by Tim Belshaw). Belshaw's creations render well both troop positions and terrain considerations. With a map placed in the book every few pages, the reader remains well informed of the 15th regiment's progression through each campaign and battle. My only significant complaint with the study's overall presentation is with the high frequency of typographical errors. The compilation of the other main feature of the series, the regimental roster, was also well executed by the author, with entries for all 1,442 known members of the unit. The rosters are the most consistent element among the Regimental-Roster Set volumes, and should prove to be widely useful to researchers. Other appendices add source, command organization, hospital, burial, and pension information. This is a fine regimental-roster history of a far ranging and hard fighting Civil War regiment. Over the past few years, I am finding more and more publishers (including university presses, which I assume pay more than typical attention to the latest style manual trends) going with appendixes as the plural form of appendix over appendices. The latter was always in favor during my own educational years and beyond, but now they seem to be running neck and neck in the usage supremacy race. I suppose it shouldn't bother me, but appendixes just sounds goofy and wrong to me. 1. The Sumter Flying Artillery: A Civil War History of the Eleventh Battalion Georgia Light Artillery by James L. Speicher (Pelican, 2009). Pelican gets some deserved grief for some of the Civil War titles it chooses to publish, but I've found others to be worthwhile studies. Speicher's book looks to have most of the elements of a useful unit history, including a very detailed roster that will undoubtedly appeal to genealogists and researchers. Artillery battalion histories are rarely published (for a variety of reasons, I would guess), but it might be interesting to see what we can learn about this level of artillery organization in the ANV's conduct of battle, and perhaps how it changed over time. 2. Race and Radicalism in the Union Army by Mark A. Lause (Univ. of Illinois Press, 2009). Lause's book examines the social, political, and military impact of blacks, whites, and Indians serving together in the Army of the Frontier. Given the interpretive slant and relatively short length, one would guess this one had its origins in the author's thesis or dissertation. When the Civil War led the federal government to recall the regular army units patrolling the frontier, California volunteers picked up much of the slack up and down the Pacific coast and into the mountain west. Corporal Royal A. Bensell (Company D, 4th California Volunteer Infantry) was one of these men. His daily journal, beginning in March 1862 and ending in October 1864, relates his often frustrating experiences in the Cascade Mountains of Oregon. His company garrisoned Fort Yamhill, a post situated along the banks of the Yamhill River approximately 25 miles west of Salem, as well as Fort Hoskins and the blockhouse at Siletz. All of these facilities were established in the mid-1850s to police the local Indian tribes, and during the Civil War came under the administrative umbrella of the District of Oregon. 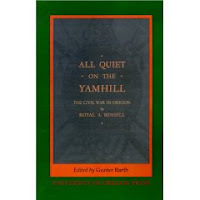 In 1959, University of Oregon Press published Bensell's diary, ably edited by then graduate student Gunter Barth, under the title All Quiet on the Yamhill: The Civil War in Oregon (cover art upper left). In 2001, UO Press came out with a paperback reprint (cover at right) but the first edition remains fairly plentiful on the secondary market. Barth contributed a Preface, extensive footnotes, a large detailed pullout map of the region, and four useful appendices [I-a summary of the local Indian population, II-a biographical sketch for Bensell, III-a short history of four Cascade forts, and IV-a Company D roster], and an index. Barth really did fine work with his explanatory notes, which were often comprised of detailed background information into persons, places, and events. The pull out map very helpfully locates the many place names mentioned in the journal, and also carefully traces the paths of Cpl. Bensell's trips up and down the coast. Ostensibly there to contain any flare up of Indian or Copperhead troubles, Bensell's company instead experienced no battles and near endless boredom. The writer penned his journal with a view to posterity, and his unromanticized and unexaggerated account of his service is indeed a valuable day-to-day record of events in a typical Far West frontier fort during the Civil War. The quality editorship of Barth's (the equal of anything produced today by the current standards of scholarship) and the journal itself combine for a unique work well worthy of consideration as a Civil War classic. B&G Magazine is following up an excellent Mine Run issue, with one about the 1862 Battle of Chickasaw Bayou (pdf file of Table of Contents) [Volume XXVI Issue #3]. Can't wait to see it. The best writing about this badly managed operation remains Ed Bearss's extensive section from his Vicksburg trilogy, but a few years back there was some talk of a book length history. I wish I could remember the prospective author. Alas, I've heard nothing since. Equally frustrating was my one opportunity of touring the battlefield, foiled by spring flooding. Bragg, Blaker, Ross, Jacobe & Savas: "NEVER FOR WANT OF POWDER: The Confederate Powder Works in Augusta, Georgia"
It's a fairly common refrain that Confederate armies, ill clothed, equipped, and armed as their soldiers may have been at times, never lost a battle because of a lack of ammunition. 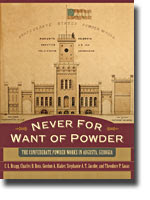 Nowhere have the reasons behind this been so well presented as in Never for Want of Powder: The Confederate Powder Works in Augusta, Georgia, a truly remarkable recent book from contributors C. L. Bragg, Gordon A. Blaker, Charles D. Ross, Stephanie A. T. Jacobe, and Theodore P. Savas. George Washington Rains is the individual most readers will associate with the Augusta facilities, and his role in its management and construction is well outlined in the book. A capsule biography of the man is provided, as well. The study then moves on with an incredibly detailed, yet very readable, four-part technical discussion of the process of powder production, from refining, mixing, and finishing the various types of powder all the way through quality control and testing. Another chapter is devoted to the next step of incorporating the powder into fixed ammunition. Like many other parts of the book, this section is supported with numerous data tables showing various inventories and production levels by month. The specialists that designed and worked in the powder works and arsenal are also given their due. Engineer C. Shaler Smith and storekeeper Major I.P. Girardey are featured, as well as a host of other engineers, architects, and mechanics. Obviously, this complex would become a target once Union armies penetrated deep within the Confederacy, and the plant employees would go on to help defend Augusta in 1864 during Sherman's March through Georgia. This impressive compilation concludes with a short post-war history of the works and the later lives of the major figures involved. Each chapter written by these co-authors is well integrated with the rest. The result is a very cohesive cooperative effort, with very little in the way of content overlap. Four appendices provide further manufacturing information and reports. Although, at nearly 11 x 14 inches, one may complain of the sheer unwieldiness of this bulky and heavy tome [a table is needed to comfortably read it], but a glance at the wonderful full color architectural plates (74 in number) that grace its pages might tell the story. Often, such intricate technical drawings are so reduced in size for publication that labels and vital drawing details are lost. There is little chance of that happening here. Never for Want of Powder is truly publishing in the grand old style, an exemplar of material and content excellence. The co-authors and University of South Carolina Press are to be congratulated, for the high aspirations of the former and the latter's commitment to seeing them through to fulfillment. More than reasonably priced, anyone seriously interested in Confederate military industry and logistical requirements needs to own a copy of this landmark study. 2. American Civil War Guerrilla Tactics by Sean McLachlan & Gerry Embleton (illus.) (Osprey Publishing, 2009). Part of the Elite Series, the above pair of works are, as far as I know, the first Civil War books from Osprey that specifically look at tactics. The former seems to focus on raiding and defensive countermeasures rather than introducing the reader to the strategic or operational use of railroads during the war. The latter takes an across the board look at its subject, perhaps defining guerrilla warfare a bit too broadly given its section on Brice's Crossroads. Some fine looking artwork, too. 3. U. S. Grant: American Hero, American Myth by Joan Waugh (Univ. of North Carolina Press, 2009). This one just arrived (and should be in retail outlets very soon), but I finished the ARC a while back so I can comment on it. It's my opinion that Waugh's writing and analysis in this work is at its weakest when discussing Grant's military career, but I really enjoyed the latter part of the book, a rather moving chronicle of Grant's final years and what he meant to the citizens of this country in the latter part of the 19th Century. 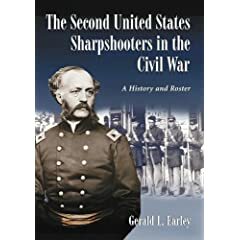 "THE SECOND UNITED STATES SHARPSHOOTERS IN THE CIVIL WAR: A History and Roster"
Gerald L. Earley's The Second United States Sharpshooters in the Civil War: A History and Roster (McFarland, 2009) is a compact organizational, service, and roster history of the unit. The section discussing the unit's formation and training focuses on the extended struggle to obtain arms, as well as target practice. Initially settling for Springfields, the men later fought with Colt Revolving Rifles before finally ending up with the much desired Sharps rifle. There is little in the text in the way of detailing the regiment's specialized tactical training. Present on the Peninsula, the 2nd USSS experienced significant combat during the 2nd Manassas battle. From there, the regiment fought at Antietam, Fredericksburg, Chancellorsville, Gettysburg, Mine Run, the Overland Campaign, and Petersburg [the 2nd was consolidated with the 1st in December 1864]. Beginning its service with only 8 companies, the unit was depleted by casualties and disease, its effectiveness going into general decline from late 1863 onward. On February 20, 1865 the 2nd was broken up for good, its companies singly redistributed to existing line regiments. Earley's battle descriptions, and the specific role played by the 2nd USSS in them, are fairly general, but the reader nevertheless gains some understanding of the battlefield use and misuse of the sharpshooters. At less than 200 pages of narrative, minute tactical examinations are beyond the scope of the study. A unit roster (with name, age, birthplace, and occupation for each member) follows the service history. Four maps are provided, as well as numerous illustrations. The bibliography includes a range of materials, to include the expected manuscripts, newspapers, books, and articles, but is limited in overall depth. While not a definitive work, The Second United States Sharpshooters in the Civil War is a serviceable regimental history. "THEIR SILENT VIGIL: A Complete Guide to the Monuments of the Gettysburg National Military Park, Volume One"
At approximately 9" x 11" in size and 511 pages in length, Robert J. Nixon's Their Silent Vigil: A Complete Guide to the Monuments of the Gettysburg National Military Park, Volume One (Tate Publishing, 2009) is a large book that puts its hefty dimensions to good use. It (in conjunction with a future volume) attempts an inventory of all Civil War monuments placed at the Gettysburg National Military Park. The author differentiates between monuments, markers, and tablets, relegating the latter two categories to a number of tables located in the forefront of the book. At its heart, the volume is a collection of detailed line drawings of each Union monument (think detailed engineering drawings, with front, back, and side views). These are arranged by state and service branch. A handful of Confederate monuments are present, with the rest presumably reserved for the second volume. There is no narrative beyond the introduction and brief explanatory notes. The complete text inscribed on the monuments is reproduced, as well as any applicable stone, marble, or bronze artwork -- i.e. sculpture, bas relief, etc. features (either in drawing or photographic format). Shading provides depth to the drawings, as well as information about materials used and roughness/smoothness of the cut. Monument dimensions (L x W x H) are labeled and photographs of each monument are also included. My only real problem with the presentation is the vagueness of the physical location given for each monument site. Only the street name is indicated, when perhaps a numbered map or GPS coordinates would have been in order. A full index would have been helpful to the reader, as well, but perhaps the second volume will accommodate one. The above minor reservations aside, I think most Gettysburg enthusiasts will find Their Silent Vigil to be a useful and attractive reference book. I've come across nothing quite like it on the market. Well, upcoming as in next summer anyway. Back in 2007, when I reviewed his excellent essay compilation “The Earth Reeled and Trees Trembled”: Civil War Arkansas, 1863-1864, editor Mark Christ mentioned that he was working on getting a book based on his Little Rock Campaign MA thesis published by University of Oklahoma Press as part of their Campaigns and Commanders series. It looks like it's found its place in the queue, scheduled for an August 2010 release, even though we all know those early dates can change. There is a link up at: Civil War Arkansas 1863: The Battle for a State . 1. Lincoln’s Proclamation: Emancipation Reconsidered - edited by William A. Blair & Karen Fisher Younger (Univ. of N. Carolina Press, 2009). This is a collection of eight essays dealing with various aspects (controversial and otherwise) of the Emancipation Proclamation. 2. The Battle of Athens: "Farthest North of the Civil War" - by Ben F. Dixon (Author, 1991). Before the 2007 publication of Jonathan K. Cooper-Wiele's excellent Skim Milk Yankees Fighting, Ben Dixon's difficult to find compilation was the closest readers could get to a book length study of the Athens battle. It's still worth owning. Grandchamp: "THE BOYS OF ADAMS' BATTERY G: The Civil War Through the Eyes of a Union Light Artillery Unit"
Battery G, 1st Rhode Island Light Artillery participated in nearly all the major engagements fought by the Army of the Potomac, from the Peninsula in 1862 onward. During Petersburg Campaign's final breakthrough on April 2, 1865, members of the battery accompanied the assaulting infantry, with the intent of manning captured guns and turning them back on the enemy. Performing this task superbly, seven battery mates were awarded the Medal of Honor. Robert Grandchamp's The Boys of Adams' Battery G is a quality unit history, well worthy of chronicling the service of these men. Along the way, more general insights into the organization, arming, training, and the battlefield roles of Union volunteer batteries are also gained. Grandchamp's chapter length narrative summaries of the Rhode Islanders' role in each battle and campaign are quite good. They begin with the Peninsula (most specifically Fair Oaks) and move on through Antietam, Fredericksburg (both 1862 and 1863 battles), Gettysburg, Granite Hill (fought during the Gettysburg retreat), Mine Run, the Wilderness, Spotsylvania, Cold Harbor, Cool Spring, Opequon, and Cedar Creek, before ending with the final spasms of the Petersburg Campaign in 1865. Unit histories, especially battery studies, often suffer from a dearth of maps. Here, they are provided in both high numbers and quality [the Granite Hill map is especially descriptive]. Fairly good at marking both troop positions and terrain features, each map does explicitly mark the battlefield position(s) of Battery G, an essential feature that all too many unit studies lack. The book's subtitle, The Civil War Through the Eyes of a Union Light Artillery Unit, aptly describes the content, as the author mined an abundance of manuscripts and other primary source materials. A stroll through the Acknowledgments section indicates that Grandchamp also consulted a large number of noted experts on each battle. A detailed roster is included as an appendix, as well as a few unit demography tables. Good battery studies do not exactly abound in the Civil War literature, making Grandchamp's book all the more important, both as a font of information and an example for others to follow. The Boys of Adams' Battery G is a fine unit history. Highly recommended. 1. The Southern Mind Under Union Rule: The Diary of James Rumley, Beaufort, North Carolina, 1862-1865 - by Judkin Browning (Univ. Press of Florida, 2009). Part of Florida's New Perspectives on the History of the South series, this volume is a nicely annotated diary of a man that maintained a passive facade to the Union occupation of his town, but seethed inside. 2. 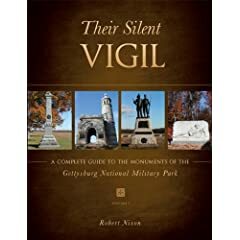 Their Silent Vigil: A Complete Guide to the Monuments of the Gettysburg National Military Park, Volume One - by Robert J. Nixon (Tate Publishing, 2009). This is a large dimensioned paperback (first of two volumes) that aims to provide a visual inventory all the GNMP monuments. There is no narrative, with most pages comprising detailed line drawings of each monument (think detailed engineering drawings with front, back, and side views). The complete text inscribed on the monuments are reproduced, as well as the artwork -- i.e. sculpture, bas relief, etc. features (either in line drawing or photographic format). It has some flaws I noticed immediately that I'll go over in the review, but I think most Gettysburg enthusiasts will find it a useful reference book. 3. Griswoldville - by William Harris Bragg (Mercer Univ. Press, 2009). Paperback reprint of the 2000 1st ed. hardcover. Appears unchanged.